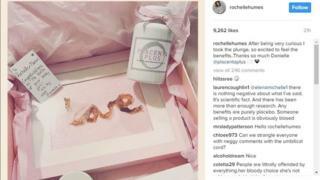 Singer Rochelle Humes has come up with an unusual way to mark the birth of her second daughter Valentina Raine. The Saturdays star revealed on Instagram she has turned her baby's umbilical cord into a piece of art. She posted a photo of the cord spelling out the word 'Love' which was displayed in a pink frame. It divided opinion on the social media site with some saying it was "gorgeous" while others described it as "disgusting". With many parents wanting a special reminder of their baby's birth, what else could you do with the umbilical cord? Newborn babies normally leave the hospital with the stump of their umbilical cord still attached. Between five and 15 days after the baby's birth, it will dry out, turn black and drop off. Some parents decide to keep the remainder of the cord as a keepsake and store it in a special box or scrapbook. One seller on Amazon offers a keepsake box which has spaces designed for a child's umbilical cord, lock of hair and all of their baby teeth. If you don't fancy having the umbilical cord on your wall, you could always hang it around your neck. Some businesses offer parents the chance to turn their baby's cord into pieces of jewellery. Nic Kamminga, who offers the services through her company Tree of Opals, says it is a popular choice for many wanting a memento. "I think parents want to keep it because it's the last physical bond you have with your baby," she said. "It's something you've shared. For me it's really beautiful. My daughter Ayla will look at the charm I've had made and say 'that's mine'. "In a world with digital photos it's nice to have something physical. When I post on my Facebook, some people think it's gross but others think it's amazing." A trend emerged in California which saw parents burning the umbilical cord, rather than clamping it. Those involved say it helps each family member bond with the new baby by allowing them to be involved in the birthing process. Typically a burn box is used which catches the hot wax and keeps the candle steady. While, parents may be able to opt for the choice if they are having a home birth, it is not likely to be a routine offered in many hospitals. In an article on the Royal College of Midwives website, writer Julie Griffiths says: "There is the dubious action of waving a naked flame near a newborn or, indeed, new mother who presumably is lying in bed, covered by sheets - hopefully flame retardant ones. "If all of this was not bad enough, the ultimate irritation must be having a crowd of people gathered immediately after birth, gawping at the infant who has just emerged from the womb and exhausted mother. "Surely, the most important bond at that stage of new life is the one with mother, not extended family." Parents can choose to donate their little one's umbilical cord to a blood bank - and potentially save a life. Cord blood is rich in stem cells and can be used to treat patients suffering from life threatening diseases. These include cancers of the blood, bone marrow failure, sickle cell anaemia, immune deficiencies and metabolic disorders, says the NHS Cord Blood Bank. There are currently six NHS hospitals which have dedicated, trained staff to collect cord blood. Once the cord blood has been frozen, it is stored until it is needed by a patient either in the UK or worldwide. Melissa Thermidor donated her cord blood in 2016 after the birth of her daughter Maya. She says: "It was an amazing feeling to think that as well as bringing new life in to the world I might also be saving another. "Myself and my husband were very passionate about donating especially because of the need within our communities. "We were aware there were many people in need of donors from black and Asian backgrounds." Edward Dobranszky, NHS Cord Blood Bank manager, says: "Cord blood, which is collected from blood taken from the placenta and umbilical cord following the birth of a baby, is rich in stem cells. "Cord blood donors save the lives of thousands of children and adults with blood cancers every year." If the thought of keeping a dried out vein as a happy memory does not appeal, then the other option is simple. Just dispose of it, in an appropriate manner.